Santa will continue to greet the people of Monifieth in the run-up to Christmas. Lochee is set to welcome the festive season with a host of Christmas celebrations – starting this weekend. 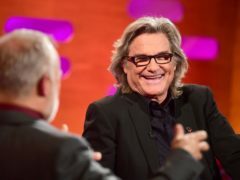 Kurt Russell has said his partner Goldie Hawn hated the facial hair he grew while filming Quentin Tarantino’s film The Hateful Eight. Dundonians braved the freezing weather to view the grand turn-on of the city’s Christmas lights this evening. Radio 4′s Nick Robinson has apologised to horrified listeners after suggesting live on air that Father Christmas is not real. Santa Claus took time out of his busy Christmas schedule to pay a visit to the Wellgate Centre, where he met children at his very own grotto. The Tele went along to take some festive snaps. Ninewells Hospital, Dundee, welcomed a very special visitor on Friday when Santa Claus stopped by to spread some festive cheer.